Hello From Michelle Anderson - I'm so excited about our live clarinet event in June! Michelle Recommends - Clarinet Celebration - Join me for an incredible few days of amateur adult masterclasses, clarinet choirs, technic classes and more, alongside live performances by some of the greatest clarinetists in the world. Hello to all clarinetists in the Clarinet Mentors Community! I know it has been a long time since an official Clarinet Mentors Newsletter has gone out. My apologies. There are lots of exciting things going on that I want to share with you. I have had a very busy fall with performances that include The Merry Widow with the Vancouver Opera, Silent Night, a very powerful opera about the Christmas truce in World War One, and some fun chamber music. It is always great to perform a wide variety of things. Some of my performances this year fall into the "scary" category for me. I am reminded that ALL of us as clarinetists have moments where we have very little confidence in our ability to sound as good as we would like. This strikes fear into the clarinetist who has played for 60 seconds, and for those who have played for 60 years. If you feel this way, you are not alone. I've created a free training program for you to help with this in today's newsletter that includes a downloadable Clarinet Mentors Practise Planner. I am also super excited about Clarinet Celebration, a live clarinet event in Portland Oregon, in June which David Shifrin is organizing. There will be a very special Clarinet Mentors program as part of this event. I can't imagine a better setting for clarinetists of all levels to gather together and learn lots, be inspired and have some fun music together. See below for details. I really hope you will consider joining us. If you are new to the Clarinet Mentors Community, welcome! I hope that you enjoy the ongoing resources here. Today's free training (see below) has lots of information that will be helpful to any clarinetist. Thanks for being in my community! Do you ever feel like you are never going to sound as good as you like? Do you feel like you probably aren't "good enough" to play with your local musical group? Do you feel like you can play it at home, but not when anyone is listening? If there is anyone in the clarinet world who doesn't answer "yes" to some of these questions, you are probably some new suped-up Artificial Intelligence Clarinet Machine, because these are very real, very human thoughts that most of us experience! Did you know that you can practise confidence in the same way that you can practise finger technic by working on scales and finger patterns? 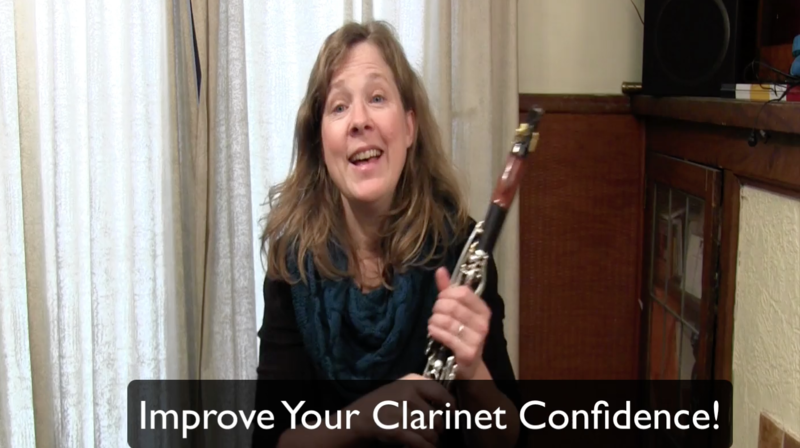 I'm giving you some great resources today to help you improve your clarinet confidence. First of all, you'll find my own mini Ted-Talk (since it is about 18 minutes) that really explains more about how we learn on clarinet, and how you can improve your confidence building. I base this thinking on over 35 years of working with thousands of clarinetists, and other musicians. Secondly, there is a great free tool that you can download and start using immediately - The Clarinet Mentors Practise Planner. If that wasn't already two great resources, I have included links to several bits of helpful free training videos that you can use to improve one area of focus in your clarinet playing (you choose the area). We are our own worst critic, and we want to turn our inner critic into a productive "How can I improve that challenge?" coach. The best way to improve our confidence is to intentionally create mini success experiences, every day that we play our clarinet. The best way to create mini success experiences, every day that we play our clarinet, is to create a plan to improve one very small area of our playing, and follow it. For step-3 to work best, we need to know HOW to improve that area of our playing, and there are tools available to help us. If you want some handy tools, download the Clarinet Mentors Practise Planner and look at all the free video training resources on this page. This is HUGE news for all of us in the Clarinet Mentors Community! David Shifrin, one of my childhood "Clarinet Heroes", is organizing an incredible festival of clarinet concerts, a youth competition, masterclasses, gear tryout rooms, many clarinet sessions with great artists and more! The best part for us, is that he has invited the Clarinet Mentors Community (that's you and me) to come and create a meaningful set of activities for amateur adult clarinetists. This will include access to all of the stellar concerts and recitals, a chance to participate in masterclasses with myself and some of these great artists in our own, safe, amateurs-only space, daily clarinet choir sessions where you get to play with like-minded clarinetists and so much more. NOTE: We will accommodate lots of people from the Clarinet Mentors Community. However, there is only space for 30 people to register for a mini-lesson during one of our live masterclasses throughout the session. 12 of those spots have been reserved. If you would like that extra training at no extra charge, you need to be one of the next 18 people to register. I expect those spots will go quickly once this newsletter reaches the inbox of thousands of clarinetists today. Having said that, there will be plenty of learning opportunities for all of us, even if you are number 31 to register! I hope to see you in person at this exciting event! 1. Clarinet Mastery Live Trainings - I go live, online with members of this course twice a month, and answer all of their clarinet questions. I also give personal feedback to a few volunteers each session who have a mini-lesson with me. You can be part of a great community, and get live feedback from me about your clarinet issues. There is so much to enjoy and learn within this community! We have a live session in about 24 hours that you could be a part of if you sign up now (and you get a recording of the replay if you can't make it in person). 2. Mastering Clarinet Music Club - I give you 2 new pieces of music each month with lessons on how to prepare the music. Recently, I have coaxed some of my musical colleagues to join in so that you can have play-along recordings with professional string players and pianists. It is awesome. Thanks for being a part of my clarinet community! Feel free to email if you have questions, comments or things you would like to see in future newsletters. I hope that you enjoy great music with your clarinet playing this week. Stay connected with news and updates! Don't worry, your information will not be shared.